On June 22, Senate Republicans released a discussion draft of the Better Care Reconciliation Act (BCRA), their companion bill to the House-passed American Health Care Act (AHCA). The legislation, which reforms the Affordable Care Act (ACA), was drafted over the past seven weeks by a 13-member Senate Republican working group that included Senate Majority Leader Mitch McConnell (R-KY); Finance Committee Chair Orrin Hatch (R-UT); Health, Education, Labor and Pensions Committee Chair Lamar Alexander (R-TN); conservatives such as Senators Mike Lee (R-UT) and Ted Cruz (R-TX); and moderates such as Senators Rob Portman (R-OH) and Pat Toomey (R-PA). The BCRA draft largely mirrors the framework of the legislation passed by the House in May, reworking the ACA's income-based premium subsidies; eliminating the individual and employer mandates; providing additional flexibility to states to waive various ACA provisions; repealing ACA-related taxes; phasing out the Medicaid expansion; and transitioning Medicaid to a per capita cap or block grant program. Reforms ACA’s Tax Credits: Beginning in 2020, the BCRA would change income eligibility for premium tax credits to 350 percent of the Federal Poverty Level (FPL), from the 100 percent to 400 percent FPL covered under the ACA. The bill would replace ACA's benchmark plan for premium tax credits from the second-lowest cost silver plan – covering 70 percent of actuarial value (AV) – to the median-premium 58 percent AV qualified health plan. The proposal would also establish age and income-adjusted percentages for calculating required premium contributions, ranging from 2 percent for those in the lowest income band, regardless of age, to 16.2 percent for those in the highest income band and the oldest age band. All individuals below 150 percent of FPL would contribute the same percentage of income towards premiums regardless of age. Finally, the BCRA excludes individuals with access to any employer-sponsored coverage from eligibility for premium tax credits. Appropriates Funds for Cost-Sharing Reductions (CSR): Cost-sharing subsidies to help pay insurers for low-income individuals' out-of-pocket expenses would be funded through 2019, and repealed beginning in 2020. Eliminates Individual and Employer Penalties: Retroactive to 2016, the BCRA eliminates penalties for the individual and employer mandates. Creates a Short-Term Insurance Premium Stabilization Fund and a Long-Term State Stability and Innovation Program: The BCRA provides $112 billion to support individual market risk pool stabilization across two programs, a short-term fund to help health insurance issuers address coverage and access disruption, and a long-term program that provides funding to states for premium stabilization and incentives for individual market participation. Specifically, the bill would provide $50 billion in funding for the short-term insurer assistance program, $15 billion per year for 2018 – 2019 and $10 billion per year for 2020 – 2021, to be distributed at the discretion of the CMS Administrator. The bill would also provide $62 billion for the long-term state stability and innovation program, allotting $8 billion for 2019, $14 billion per year for 2020 – 2021, $6 billion per year for 2022 – 2023, $5 billion per year for 2024 – 2025, and $4 billion for 2026. States would be required to match the federal contributions at a gradually increasing rate starting at 7 percent in 2022 and capping out at 35 percent in 2026, the final year of the program. Under the provision, states can apply for funding to establish or maintain a program for a number of purposes, including providing financial assistance to help high-risk individuals; entering into arrangements with health insurance issuers to stabilize premiums and promote state health insurance market participation in the individual market; providing payments for health care providers for the provision of health care services; and/or providing assistance to reduce out-of-pocket costs. Funds for the program would be distributed according to an allotment methodology specified by the CMS Administrator. However, for 2019, 2020, and 2021, at least $5 billion of the amounts appropriated must be used by states for reinsurance assistance. 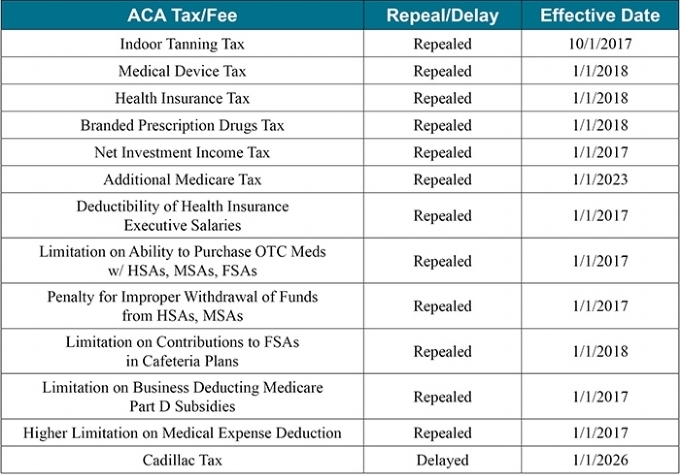 Repeals ACA's Taxes and Fees: The BCRA repeals or delays most of the ACA’s taxes and fees across varying timetables. Rolls Back Medicaid Expansion: For states that implemented the Medicaid expansion as of March 1, 2017, the bill would maintain the current federal match for newly eligible enrollees (90 percent) through 2020. The federal match to these states for Medicaid expansion funding would reduce to 85 percent in 2021, 80 percent in 2022, 75 percent in 2023, and then drop to the state's regular federal match by 2024. States could still elect to expand Medicaid through 2019; however, any state that implements the expansion after February 28, 2017, would not receive the higher matching rate to cover the new expansion enrollees. Transitions Medicaid From a Federal Matching Program to a Per Capita Cap or Block Grant Program: Starting in Fiscal Year (FY) 2020, the bill converts federal Medicaid financing from an open-ended federal and state entitlement program to a per capita allotment and creates per-enrollee caps for 5 enrollment groups: 1) elderly, 2) blind and disabled, 3) children, 4) expansion adults, and 5) other adults. States would select a period of 8 consecutive fiscal quarters between Q1 FY 2014 and Q3 FY 2017 to serve as a baseline. Growth in federal Medicaid spending for each enrollment group would be adjusted forward from the baseline tied to the medical care component of the Consumer Price Index for all urban consumers (CPI-U) for children, expansion adults, and other adults, and the medical care component of CPI-U plus 1 percent for the elderly and blind/disabled groups through 2025. In subsequent years, growth for all enrollment groups would be adjusted using CPI-U only, which is expected to grow at a slower rate than the medical care component of the CPI-U. States would also have the option of choosing a block grant system instead of a per capita allotment for non-elderly, nondisabled, non-expansion adults only for a period of 5 years, beginning in FY 2020. After the 5-year period, states would revert to the per capita cap financing system if they do not extend the block grant option. The total block grant amount for the initial year would match the baseline per capita allotment, increased in subsequent years by CPI-U. States can roll over unused block grant funds into the next year as long as they continue to elect the block grant option. Under the block grant option, as part of the "targeted benefit package" states must provide mental health and substance use disorder services. In addition, states may impose cost sharing under this option – not to exceed 5 percent of the family's annual income. Finally, if prescription drugs are included in the block grant benefits option, they would be subject to the Medicaid rebate program. In both the per capita cap or block grant systems, states would be provided significant new flexibilities in managing their Medicaid program spending and benefits, with certain requirements. The DSH allotments for Q2, Q3, and Q4 of FY 2024 and subsequent FYs shall be determined as if there had been no increase in the state's DSH allotment for FY 2020 as described above. For expansion states, there is no change in the ACA's Medicaid DSH payment reductions for FY 2017 – 2024. Establishes Safety-Net Funding for Non-Expansion States: For FY 2018 – 2022, states that have not implemented the Medicaid expansion as of July 1 of the preceding year may receive safety-net funding to adjust payment amounts for Medicaid providers. Such states would receive an increased matching rate of 100 percent for FY 2018 through FY 2021 and 95 percent for FY 2022. The bill would provide a maximum of $2 billion per year for the program for a total of $10 billion from FY 2018 through FY 2022. State allotments would be determined according to the number of individuals in the state with incomes below 138 percent of FPL in 2015 relative to the total number of individuals with income below 138 percent of the FPL for all non-expansion states. Lowers Medicaid Provider Tax Threshold: The bill phases down the Medicaid provider tax threshold from the current level of 6 percent to 5.8 percent in FY 2021, 5.6 percent in FY 2022, 5.4 percent in FY 2023, 5.2 percent in FY 2024, and 5 percent in FY 2025 and subsequent FYs. Increases Flexibility and Financial Incentives for Section 1332 Waivers: The proposal appropriates $2 billion for FY 2017 – 2019 to help states apply and implement Section 1332 waivers. The bill would significantly amend the ACA's Section 1332 waivers by removing existing conditions for coverage, affordability, comprehensiveness, and federal-deficit neutrality, and instead only require that the state’s plan would not increase the federal deficit. States would be able to waive numerous ACA requirements under Section 1332 waivers, including Essential Health Benefits (EHBs). If enacted, the federal government would be required to accept all state waiver applications that meet the federal deficit requirement (which could last for up to 8 years, and then be renewed for an indefinite number of 8-year periods) and would be prohibited from terminating waivers mid-period. Changes the ACA's Insurance Market Rules: Starting in 2019, the bill replaces the ACA's 3:1 age-rating ratio with a default 5:1 age-rating ratio and allows states the option of setting their own age-rating ratio. In addition, starting in 2019, states, not the federal government, would determine the Medical-Loss Ratio for insurers. The Congressional Budget Office (CBO) expects to issue an estimate of the impact of the legislation early next week. In addition to obtaining a CBO score, the Senate Parliamentarian will review the bill to ensure that it satisfies the requirements of the reconciliation process. Under the so-called "Byrd Rule," any bill considered through reconciliation must materially impact the budget and must not raise the deficit over a 10-year period. As a result, the Senate draft is expected to undergo changes before reaching the floor. The Parliamentarian may also rule against the inclusion of the Section 1332 waivers and repeal of certain ACA market rules as having only an "incidental" budgetary impact, which were key elements that attracted conservative support. The bill is expected to bypass the committee process and reach the Senate floor early next week for 20 hours of debate. The bill will then be open for amendments, which will allow members of both parties to highlight their areas of concern. Senate Republican leaders are hoping for a vote on Thursday, June 29 before the Senate leaves town for the Fourth of July recess. The bill will need only 50 votes for passage – assuming Vice President Pence breaks a tie vote in Republicans' favor – under the already approved budget reconciliation process. All Senate Democrats are expected to vote against the bill, which means only two Republican Senators can vote against the legislation while still assuring passage in the Senate. Potential Republican opposition to the measure lies with the moderate and conservative members of the party. Moderate Republicans such as Senators Susan Collins (R-ME) and Lisa Murkowski (R-AK) have expressed concerns with the timeline for the Medicaid expansion phase out, the comparatively lower level of support for rural and elderly Americans, and the defunding of Planned Parenthood. Meanwhile, four conservative Republican Senators – Ron Johnson (R-WI), Mike Lee (R-UT), Rand Paul (R-KY), and Ted Cruz (R-TX) – have already announced their opposition to the draft "as written" for failing to more fully repeal the ACA. Senator Dean Heller (R-NV) has also expressed his opposition to the proposal, focusing his criticism on Medicaid cuts in the discussion draft. If the bill passes the Senate, action will shift back to the House, which will either vote to accept the Senate-passed package or will instead elect to appoint conferees, who will seek to reconcile differences between the House and Senate packages. While the Senate draft is similar to the House-passed AHCA, there remain a number of differences that will need to be addressed before any legislation moves to the President for his signature. For instance, the AHCA and the BCRA include different rules for Section 1332 state waivers. The two proposals also offer different premium tax credits and, perhaps most importantly, have two different approaches for ending the Medicaid expansion and transitioning Medicaid into a per capita cap or block grant program. If BCRA passes the Senate, observers expect the House to agree to the Senate-passed version to avoid drawing the process further into the summer. If the House and Senate pass a final health reform package, President Trump is expected to sign the measure into law. For additional detail, please see our side-by-side comparison of the AHCA and BCRA. We will be tracking and reporting on progress in both the House and Senate over the coming weeks. Feel free reach out to us directly if you have any questions in the interim.